A touch sensitive medium gain overdrive pedal with added controls! 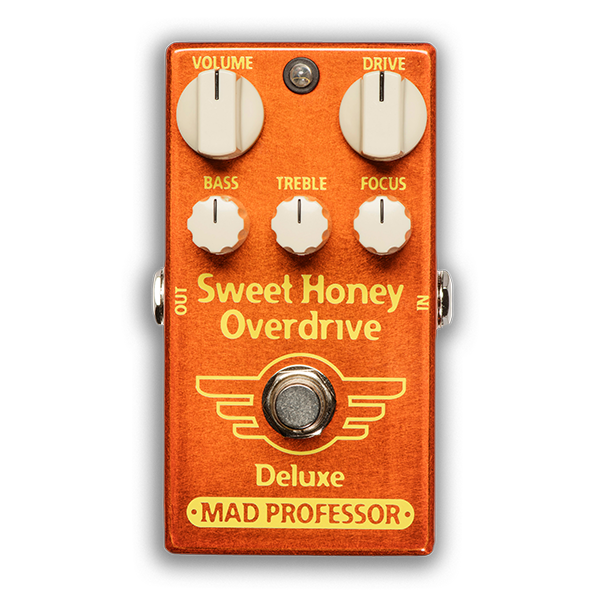 Sweet Honey Overdrive Deluxe (SHOD DLX) is designed to overdrive distorted amplifiers and give dynamically controlled low to medium gain tones with clean amplifiers.Our unique focus control allows you to adjust the feel and dynamics of the pedal as well as the overall EQ. Distortion levels are controlled by pick attack. Pick harder for more overdrive and play softer for a cleaner tone. The Sweet Honey Overdrive Deluxe provides more versatility than the classic sweet Honey overdrive due to the added functionality of the new controls. Both the SHOD and SHOD DLX are designed to work with all kinds of guitars, amplifiers, and pedals. CONTROLS VOLUME: Sets the output volume. DRIVE: Controls the amount of overdrive. TREBLE: Post distortion, it cuts and/or boosts the treble. BASS: Pre-distortion, it sets how the bass and low mids are distorted. FOCUS: Controls how easily the circuit distorts as well as adjusting overall eQ. Turning CCW gives less distortion and a mellower effect, turning CW gives a slight treble boost and earlier distortion. A good starting point is 11 o’clock. ELECTRICAL SPECIFICATIONS Supply voltage range: 7.5 to 18VDC Current consumption: 6 mA at 9VDC Input impedance: 390K Ohms Output impedance: 25K Ohms Complete bypass (true bypass) POWER REQUIREMENTS 6F22 9V battery or DC eliminator 2.1 mm plug center negative and positive sleeve.